One of the pioneers of electric car manufacturing, Tesla Motors Inc., only recently announced plans to build a new $5 billion factory for the production of batteries. This factory they hope will power their range of zero emissions electric mobiles for the next decade. What surprised local politicians and workers was the fact that Tesla announced it would not be building this factory in the Golden state. Based in Palo Alto, California, the new factory announcement has seen Tesla shares reach a new peak. Tesla is looking to become the largest producer of Li-ion batteries with the coming in operation of its new multi-billion dollar factory. The company will work in tandem with the Japanese company Panasonic corp. on this project with the Japanese investing $1 billion to kickstart the project, while $2 billion being added by Tesla. It is reported that the Japanese company is looking to further strengthen its ties with Tesla as a result of this association, with the name of other investors for this project being kept in wraps. According to analysts, keeping in mind Tesla’s own demand for its Li-ion batteries, it could well become the world’s largest manufacturer of these batteries. Tesla is planning to make its batteries from scratch using raw ore instead of assembling batteries from components. Experts believe that this move will significantly cut down on its production costs. Tesla is looking to overcome a shortage of batteries that is hindering the sale of its cars. While the idea of electric cars has been widely lauded, it hasn’t transformed into a widespread appeal for the vehicle. Market experts believe that the price of the car will play a huge role in determining that. If the price comes down there are chances of the demand and appeal of these vehicles increasing. Tesla it is believe will be able to bring the cost of the vehicle down owing to its own production of cheaper batteries. The location of the new battery factory has not been determined as yet, but there are tentative plans to base the factory in one of the Southwestern US States such as New Mexico, Texas, or Arizona. 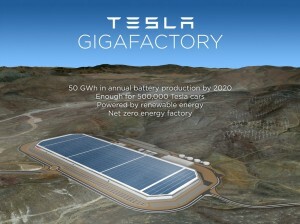 According to the company’s plan, the batteries once completed will be transported back to the Fremont, California. The company expects to produce 500,000 cars per year with each car being priced at a comfortable $35,000. While the state of California appears to be in love with the company, there is little love coming back from the other side. The snubbing of the state for the location of the new factory has been an indication of that. Yet, if former head of Tesla is to be believed, that decision is based primarily on business reasons with costs of land and labor in California pretty high. On BatterySharks.com you can find quality replacements for the most popular models of SLA batteries such as the CSB HR1234W, UB12120 and CP1290 battery.